Roof visualization tools work pretty well. 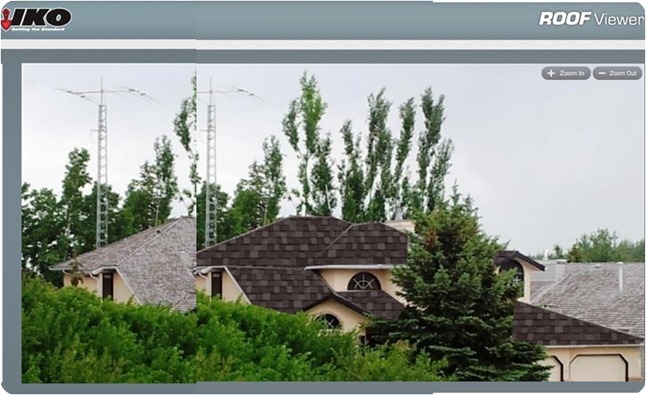 If you ever plan to replace your roof or paint your house, there are a whole range of roof visualization tools that you can use to create before and after comparisons. I thought I would give them a try as part of my roof replacement project. The graphic above shows the results of the ROOF Viewer tool on the IKO web site. These tools are pretty easy to use. First, you take a picture of your house and upload it. I started with a picture taken from a small hill across the street, which showed lots of roof as well as surrounding trees and houses. Second, you identify which part of the picture is the roof. There are two ways to do this. One is to outline the roof sections with straight lines forming enclosures. The other is to paint over your roof. Either way, you do this with your PC mouse and a steady hand. I found the approach using straight lines more forgiving and easier to control. Third, you get roof visualization by applying shingle textures to the areas marked as “roof” in your picture. The result is shown on the right of the picture above. Modifying your picture to identify the roof sections takes a bit of effort. Fortunately, this is done with an overlay. If you screw up you can simply start over. These online tools are pretty well designed and give you good instructions. The reason I found that “enclosing lines” method better was that it was easier to modify the outline and correct your mistakes without starting over. My one complaint though is the lack of ability to scale the textural patterns. If you look at the “new” roof visualization at the right above, you will notice that the pattern of the shingles is much larger than real life. It would have been good to be able to scale this pattern down by 50%. But the tool did not provide for this. Challenges aside, the roof visualization tool enabled us to test various shingle colors and patterns and then select the one that seemed to work best.